Checking the condition for pair of linear equations in two variables. 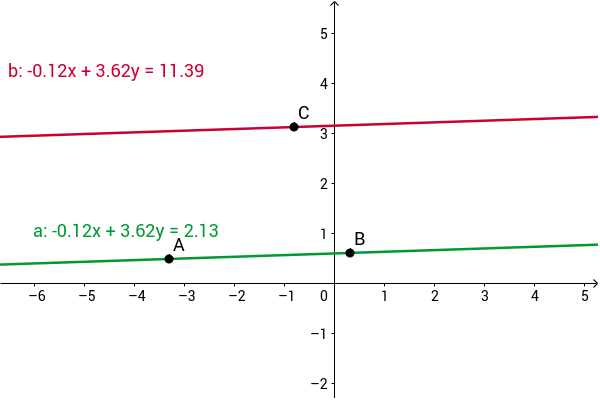 Here we have two straight lines; first is a1x+b1y+c1=0 (red) and the second one is a2 x+b2 y+c2=0 (green). Line ‘l’ (green) passes through two points A and B. Line ‘m’ (red) passes through the point C and is parallel to the line ‘l’. Observe how the positions of the lines change when we move the points A, B and C.
Questions to think about When we move the points A, B and C, find the relation between a1/a2, b1/b2, c1/c2 . What do we get? What happens to a1/a2, b1/b2, c1/c2 when the two lines overlap?